Time management systems are like diets. You can try all of these different "proven" methods, but nothing will work if you don't actually commit. Simply buying the diet product doesn't mean you've lost weight. It means you now have the TOOL to lose some pounds, but it's up to you to successfully implement it. 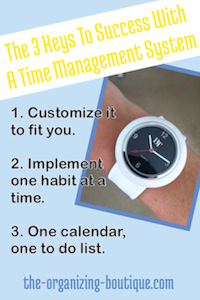 And that leads me to the 3 things you must do to make any time management system successful. Enjoy! Have you tried to adopt many different time management systems with no success? Do you keep trying new ones hoping that you'll stumble across the one that finally actually works? Can't figure out why all of these so-called easy, amazing time management routines just don't stick? Do you eat raw meat from the grocery store? Of course not! It has to be seasoned, prepped and cooked to your liking. So...why would you try to implement a time management system as is and expect it to work? In learning time management, it is absolutely imperative that you customize whatever system it is that you are trying to adopt so that it fits you and your lifestyle. Whether you're looking into David Allen's Getting Things Done routine or starting from scratch and making one up, this workbook will lead you every step of the way. 2. Implement habits ONE at a time. Time management systems, whether it is someone else's or it is your own, are made up of a collection of routines. Routines are successfully implemented habits, and habits take time to adopt. One habit takes a good amount of time to become routine, so trying to force yourself into a bunch of new habits all at once is destined for failure. In order to be victorious in learning time management skills, one small habit can be worked into your life at a time. I like to give myself a month to adopt and commit to it before introducing the next one, but give yourself whatever amount of time makes sense for you. 3. ONE calendar, ONE to do list. Often I have clients call me in need of help with their calendars and to do lists. What I typically find is that there are multiple calendars being utilized and tons of to do lists, and therein lies the problem. No matter what you're time management routine looks like, if you have calendars and to do lists all over the place then getting things done will be difficult. Time will be wasted on things like attempting to locate a particular to do list (aka napkin, back of an envelope, tiny scrap of paper). Avoid this altogether and keep ONE to do list and ONE calendar. Most importantly, apply this in a way that makes sense for you. For example, this could mean you keep one "business" to do list at the office and one "personal" to do list at home. The bottom line is to avoid to do lists galore that all pertain to the same area of your life and several different calendar attempts with different appointments recorded all over the place. Want a little extra motivation? Here are some really good-looking to do lists and free printable calendars. If you like this article about learning time management skills, then you'll like How To Set Your Goals In 3 Easy Steps.